Thanks to PJ Joanino for sharing this with us. Want to have your gadget or tech-related service review published on TP? Email it to us at events[dot]nobounds[at]gmail[dot]com. 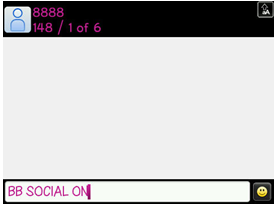 Globe BB Social Review — A Very Cheap way to be Socially Connected 24/7 for 30days with your Blackberry Smartphone. Being a teenager and a college student, it is important for me to always stay connected with my friends -- especially during this Yuletide season, when everyone’s on their much awaited Christmas break. Since I’m a Globe postpaid user with no active Blackberry Data plan (I pay my own phone bill and right now, I just can’t afford the BB SuperSurf and BB SuperSurf Max), I've decided to try Globe’s new BB Social service. For only P300/30 days, both Prepaid and Postpaid users can be socially connected on the go, 24/7. It lets you use Facebook for BlackBerry and Twitter for BlackBerry services that won't work on Wifi alone. It's very affordable! Real cheap! If you want to stay connected via Facebook, Twitter, BBM and other IM apps on your Blackberry Smartphone, BB Social could prove ideal for you. For only P300/30 days, it’s very cheap yet it delivers. I’m so much addicted to Twitter and Facebook that I don't mind the extra P300 that gets charged to my account. The bad thing is that you can't use this service for Mobile browsing (though you can always use the hotspot option whenever WiFi is available). Also, you won’t be able access your push email. And, for some reason, after I activated the service, BB Maps mysteriously disappeared on my phone. 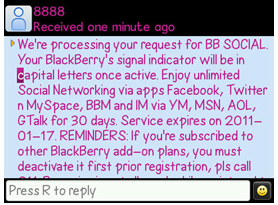 I guess Globe is doing this on purpose so you don’t accidentally use the app while you're on BB Social. I’ve already deleted ICQ and AIM on my phone but whenever I'm on BB Social, they reappear on my IM folder (it’s not really a big problem since clicking on the app icons now redirects me to a webpage that asks if I want to download the app). Also, if you’re on Twitter, you won’t be able to read Twitlonger messages since the mobile browser is needed for this. Same thing for the links on FB. Those were just some of the things I noticed. To wrap this up, here's my tip: If you cant live without your mobile browser, email push, BB Maps, and Twitlonger, you can always unsubscribe to BB social then register to BB SuperSurf or BB Max. So that's all apps? Including my apps like Engadget app? sir/maam, what about UberSocial (Twitterapp for BB)? does BB social work on this too? can I still upload photos on Twitter via Plixi or Yfrog though Im using BB Social?? that happened to me before. I was subscribed for BB SOCIAL but I was charged a thousand of pesos. I complained this to Globe customer service but they didn't give me any answer. I was super pissed of about this until I figured out the reason. CHECK YOUR SETTING. Go to Advanced Options/TCP/IP. make sure they are disabled. I set to disable and after that the unexplainable charges stopped. We have the same issue with my office mates. I am not really sure if that's the cause but you might try maybe this would be true in your case. samething as below, lost ~300Php that globe cust svc was due to the apn setting AMPOTA! Hi! Is BB Social still available? (As of May 22 2011) Thank you! Does Places in facebook works in BB SOCIAL?